I'm a bit behind due to jet lag and other post-vacation woes, but I definitely wanted to mention the Old School Middle Grade Roundtable I participated in last week over @ the Book Smugglers. 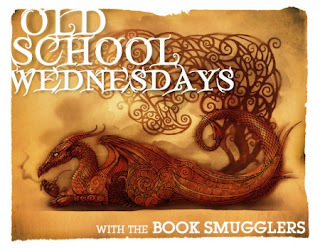 Ana and Thea took one of their weekly Old School Wednesdays (happily inspired by our very own Retro Fridays) and made it a special edition post, inviting five bloggers to sit down and discuss their top five old school middle grade books. I was there, along with Heidi @ Bunbury in the Stacks, Charlotte @ Charlotte's Library, Liz @ A Chair, a Fireplace and a Tea Cozy, and Ana @ Things Mean a Lot. So basically the stellarest of stellar company. As Liz points out, no titles overlap! Which was completely unplanned and which makes the whole thing sort of that much more awesome. I went with two historicals, two contemporaries, and one high fantasy. Stop in and see which ones I chose and check out the whole fabulous list. I saw it last week due to Charlotte - such an amazing list, with so many things I now need to read. Yeah, I jotted down several titles! It was lots of fun.